Taking care of yourself takes a bit of an effort—everybody knows that. Proper hygiene plays a big role in achieving a healthy body, and one way to practice good hygiene is through investing in bathroom accessories, which include bidets and bidet attachments. These items often require minimal investment and maintenance. They also have a very simple installation process, which means that anyone can take advantage of this remarkable plumbing fixture. For that very reason, bidets have now grown into quite an industry, with models being designed to facilitate cleaning while also being compact and affordable. Curious about this product? Then allow us to introduce to you one—the Brondell CleanSpa Advanced Bidet Sprayer. Throughout this piece, you will learn all about its features, the pros and cons of using it, and how it fares when compared to a similar product. Brondell is a company that’s been around the toilet seat business for more than a decade. 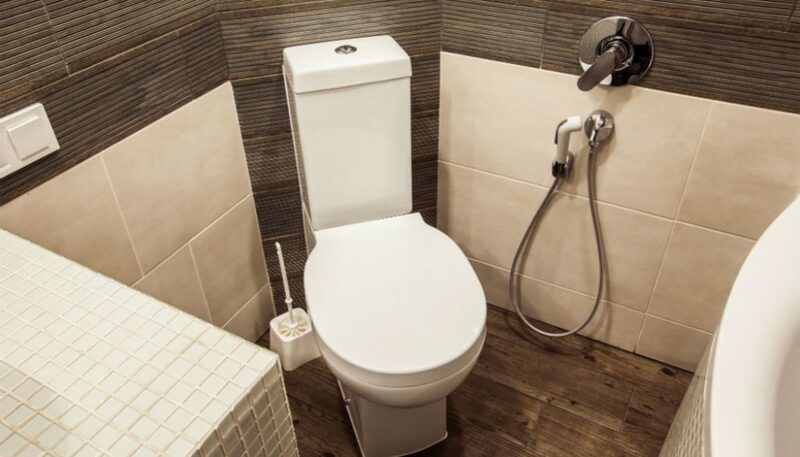 They have a vast experience when it comes to designing toilet seats in all price ranges, bidet seats, deodorizing seats, and so on. They have both the market experience and the reputation to ensure their customers that they are getting the best level of care from their products. Among the products that they offer is the CleanSpa Bidet Sprayer. But what is it really? It is a toilet attachment that is used for cleaning the perineal and genital areas in a simple and comfortable manner. It has a number of useful features, a solid build quality, and attachments that make setting it up as easy as baking a pie, all being aspects that will be discussed below. First off, know that the Brondell CleanSpa Advanced Bidet Sprayer is a mechanical device, which means it does not require electricity to function. While that makes it much simpler to operate and install, it does make for some lacking features, like its inability to heat water and the limited function it has. When it comes to its construction, Bronell really takes the cake. While the materials are chosen to keep the manufacturing cost lower, they do throw in a bit of a premium feel. This is a more budget-oriented bidet attachment, but it is built to last for years. The durable ABS plastic body is an industry standard. In fact, this material is even used in shower heads and other home fixtures. That being said, things only get better from here on out. The valves are made of brass, which means that leaking will be kept under control and that pressure won’t wear this item out anytime soon. The metal hose is very flexible and resilient to use, which is something that is important to have in such items. It even has ceramic disk seals to ensure that the pressure is reliable and that leaking won’t be a problem. Design-wise, this bidet sprayer boasts simplicity and efficiency. The instructional video clearly shows how to install the device using only a few steps and virtually no tools. The hose has a good length to it, making sure that the user will have a comfortable experience. The sprayer has to be connected to the toilet’s water supply, where the user must turn the valve on and off to provide the spray head with water. The spray head itself has a separate valve that allows the user to control the pressure. It also comes with a hook that holds the spray head, a simple and elegant solution that allows the CleanSpa to be within arm’s reach at any given time. As stated above, the CleanSpa is a sprayer. It takes the water pressure, and it releases it through tiny holes to achieve a precise, easy-to-control spray. It is installed on the toilet fill valve, making it very easy to set up and use. The only problem with this is that it can’t be used with hot water, which some people might find uncomfortable. That being said, it does provide good pressure, which is essential to any good bidet. The design of the spray head is compact, and the curved handle provides a good and comfortable angle. It is clear that ergonomy has been a key aspect that the designers applied to this particular model, and it’s a very good application. Overall, it’s a solid design, and it can definitely be put to good use. 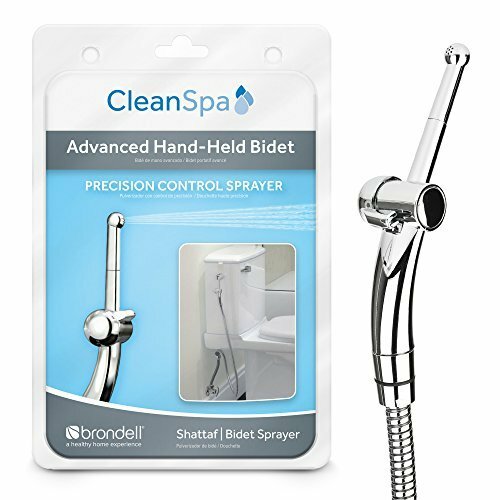 The Brondell CleanSpa Advanced Bidet Sprayer has a solid, ergonomic design and comes in a very simple package. The bidet attachment market is slowly (but steadily) growing, making shoppers more confused about what they should buy. For instance, at first glance, the Shattaf Cloth Diaper Sprayer might seem like a good alternative to the Brondell product, both being in the same price range and promising the same results. 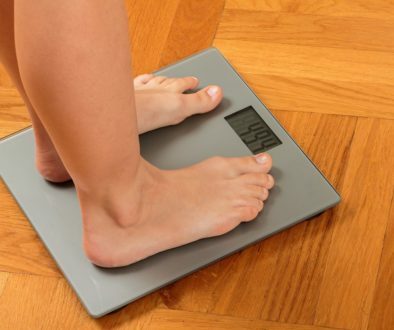 Let’s take a closer look and judge how the two measure up. When it comes to ergonomics, there’s no question that the Brondell has the advantage. The curved handle makes controlling the spray very easy. On the other hand, the Shattaf Cloth Diaper Sprayer comes with a straight handle that makes for an awkward angle and a spraying head that can get very messy and out of control. The quality of the build is also a bit questionable. Leaking is a constant problem with the Shattaf Cloth Diaper Sprayer, which turns it from a bidet sprayer into a nuisance and a burden. Everything from the plastic T-valve that comes in the installation kit to the spray head itself is built rather poorly. If you’re looking for a simple solution to an icky problem, then look no further. The Brondell CleanSpa Advanced Bidet Sprayer is an affordable, easy-to-use bidet sprayer that gets the job done. The build quality is spot on, and the design is ergonomic and pleasing. While it can’t be connected to a hot water supply, which is a drawback of sorts, everything else works perfectly. The kit contains everything you would need to get the spray up and running, as well as a means of storing it. Make sure to check the manufacturer’s recommendations and follow them closely to ensure that your sprayer will stay good as new for as long as possible.